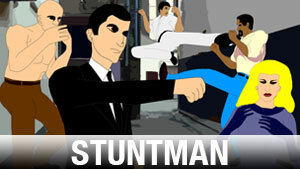 The Stuntman Character Library is an extra special one! It's one for the action and stunt films in the making. This library contains 4 guys and 1 woman in fighting poses. They'll bring your action script to life. They're in 5 fighting stances and 6 rotations: Punch, Flying Kick, Heel Kick, Ready, Reverse Punch.